– October-November 2020: Climate, sustainable development, environment: EU-Japan cross-visions in the light of the Economic Partnership Agreement. Videos program On 4 and 5 October 2016, we mentioned it, a conference devoted to the Franco-Japanese Legal Studies will be held at the Faculty of Law of Tours. This symposium is part of Nihon-EuropA program – supported by MSH and the University of Tours – whose objective is to promote knowledge of Japanese law and intensify informal and conventional partnerships between French and Japanese researchers . The October conference has no theme as such. Its organizers wanted to offer participants different perspectives on issues related to Japan and its law. French and Japanese researchers renowned contribute to this (future program). The Nihon-EuropA program is enriched gradually. The Universities of Tours and Poitiers have about it answered a call for joint project (CRA) launched by the University of Tours this year. 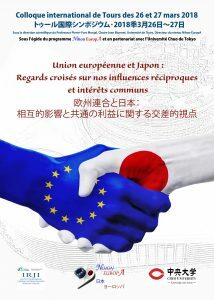 Now, over the period 2016-2018, thanks to a strong support from the University of Tours, a new program, called U-Nihon, will deploy a view to strengthen our network and organize end of 2018 an International Symposium at least 2 days on relations between Europe and Japan. All colleagues interested in the conference can contact us if they wish. The conference on 4 and 5 October 2016 will correspond to an important moment for the city of Tours, to the extent that it will organize the Fifth Franco-Japanese meeting in the same period (more info). The city of Tours has accepted our scientific event falls within the fifth meetings. This will be the opportunity for academic colleagues to participate in some events organized by the city. Professor Masahiro Sogabe will visit us at Tours University as visiting professor during the 2016-2017 year. He is Professor of Public Law, based in Kyoto University and English speaking.